President Donald Trump covered a wide range of issues during his press conference on Monday -- including sparking backlash for his comments about President Obama -- but that wasn't the only reference to his predecessors that generated a big reaction. And the latter sparked quite a response on social media -- especially Twitter. "Omg Trump literally just named the last few presidents as ‘Obama, Bush, Clinton, and Bush…. Bush Original," one user said. 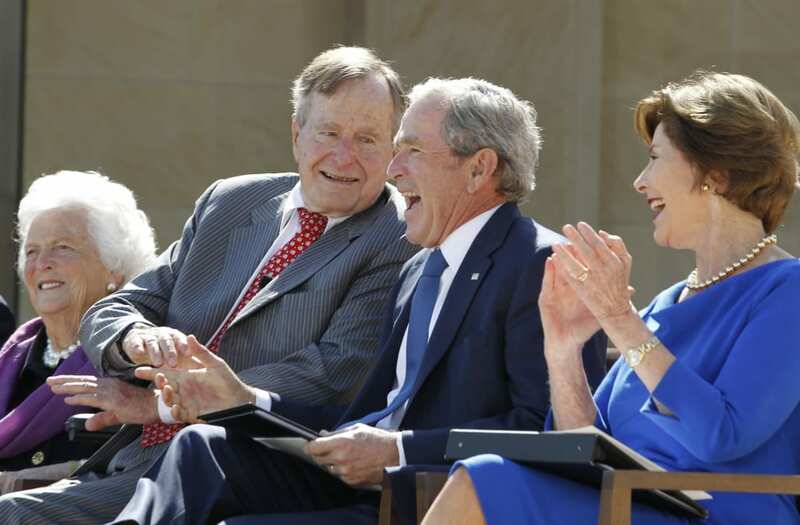 "Just heard Trump say ‘Bush Original’ in reference to George H.W. Bush…awesome," another chimed in. Members of the news media have been forced to come up with various creative names for the father and son duo, George H.W. Bush and George W. Bush, who served a combined 12 years in the Oval Office in addition to the elder's eight years as President Ronald Reagan's vice president. Those names over the years have included 41 and 43, a reference to their respective titles as the 41st and 43rd presidents of the United States. Others have shortened them to their middle initials -- "H.W." and "W." or sometimes simply "Dubya" more colloquially. But users on Twitter were quick to insist the "original" reference showed a lack of understanding or insight. "#Trump could not think of the word ‘senior’ and therefore called George Bush ‘George Bush….original’. I’d laugh if I wasn’t so terrified," one user wrote. But not everyone took it so seriously. "Trump just referred to George Bush as ‘Bush Original’ and it was definitely in my top 5 favorite things he’s ever said," one user surmised. “Trump calls George H. W. Bush, ‘Original’ Bush, leading me to wonder – Does this make George W. Bush the ‘Extra Crispy’ version?” another asked on Twitter.